One of the most advanced water-resistant toilet lights on the market, the LumiLux toilet light uses state-of the-art technology to create the perfect way to light up your toilet. Select from 16 colors or create a rainbow in your bathroom using the carousel mode. The built in infrared motion sensor detects body heat upon entry and will shut off upon exit. What also makes the LumiLux toilet light so advanced is the light detection sensor that will make sure the toilet light does not come during daytime or while the bathroom light is on. The average battery life on the LumiLux Advanced LED Toilet Light is 6 months to 1 year, depending on the brightness setting (includes 5 levels) and frequency used. The light detection sensor deactivates the LED light the instant it detects light to maximize battery life. Requires 3 AA batteries (sold separately). Features a low battery indicatory: red LED light will blink 5x. 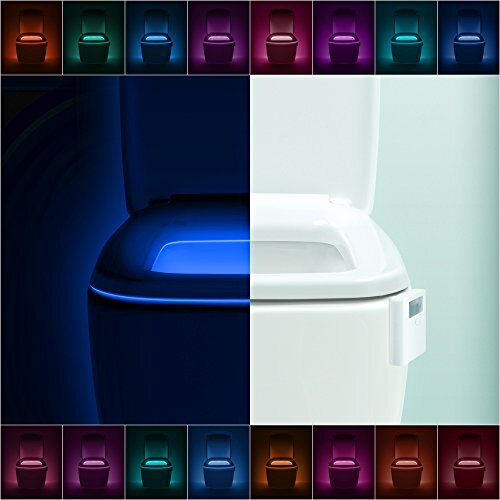 The LumiLux Advanced LED Toilet Light comes with a lifetime warranty. If you ever experience issues with your toilet light, then we will replace it for free. Just contact us directly by going to Amazon > Your account > Your Orders > Leave seller feedback > view seller profile > ask question. Send us your order ID and we will take care of you within 24 hour. Warranty only valid if purchased by Upper Echelon Products. The LumiLux toilet light housing compartment measures approximately 3.5" x 2.5" x .75" with the flexible arm extending about 4" from the housing compartment. FCC and EMC Certified. If you have any questions about this product by LumiLux, contact us by completing and submitting the form below. If you are looking for a specif part number, please include it with your message.